Sometimes it only takes a tiny thing to get human beings, the most curious animal on the planet, very excited. And that's just what happened to a team of divers exploring the ocean floor hundreds of feet underwater near St. Paul's Rocks, a string of islands off the coast of Brazil. 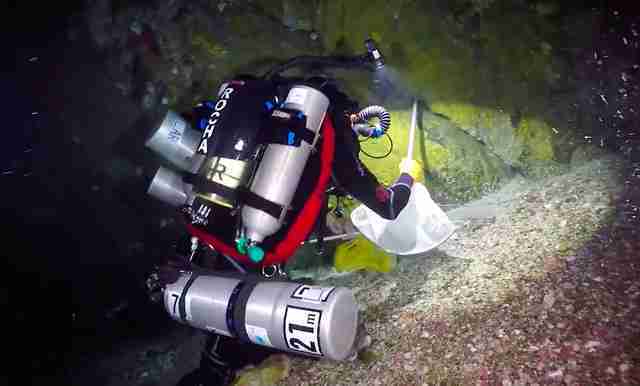 Equipped with special deep diving gear, the divers from the California Academy of Sciences were investigating a "twilight zone reef" — a kind of coral reef that's typically 200 to 500 feet deep that's rife with animals who live in a deep blue darkness. 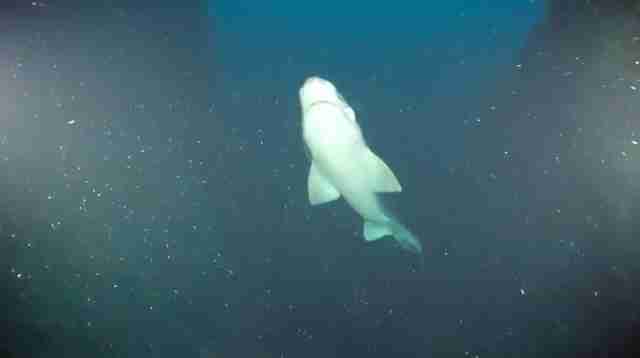 This particular twilight zone reef is very remote, about 400 feet deep, and about 600 miles off Brazil's coast, and full of all kinds of creatures found nowhere else. When the divers spotted something bright neon, they immediately went in for a closer look. 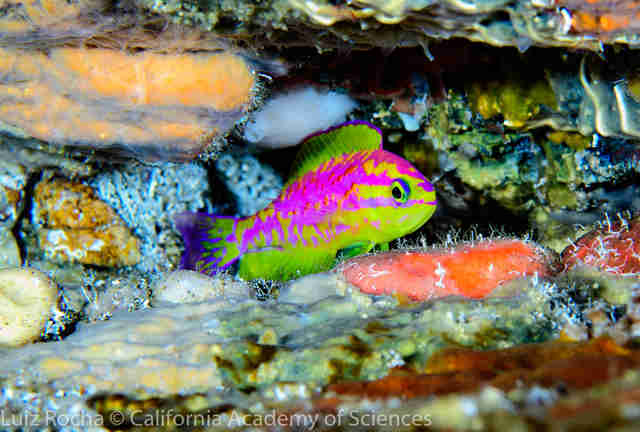 It was a tiny and very brightly colored little fish peeking out of a crevice. And it was puzzling, since it resembled a kind of fish only found in the Pacific Ocean, not the Atlantic. 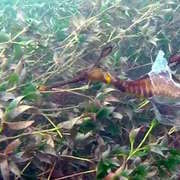 As it would turn out, they were right to be amazed: They'd discovered a new species of a genus of fish that, until now, was only known to exist in the Pacific Ocean. The team just published a paper describing the new kind of fish. The males are neon pink and yellow striped, like the one they found, and the females are a deep blood orange color. 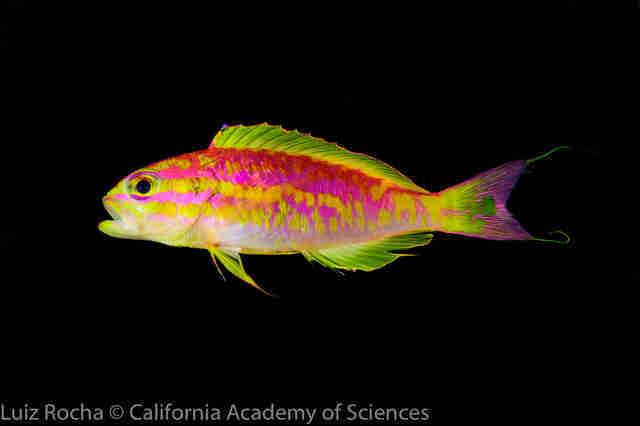 They named the fish Tosanoides aphrodite, after the Greek goddess of love Aphrodite, to capture just how enchanted they were when they spotted him. Sadly for this divinely named fish, seemingly otherworldly twilight zone reefs are not immune to the hard realities facing ocean habitats today. "The main problems these deep environments face are overfishing, pollution and climate change," Hudson Pinheiro, a coauthor of the paper, told The Dodo. "People can help protect these environments by visiting and supporting the creation of marine protected areas where unique biodiversity is able to thrive. They can also buy sustainably caught fishes and dispose of trash in the right place to ensure it doesn't end up in the ocean." As excited as the divers were about their discovery, they came away with another memory from their dive that day: Even at that remote depth, their flashlights caught the faint glint of a piece of fishing line. You can support discoveries like this and help protect these beautiful animals by making a donation to the California Academy of Sciences.